A moist, dense, sweet, buttery cake...just like eating a cinnamon roll for breakfast, but without the heavy icing and sugar content. 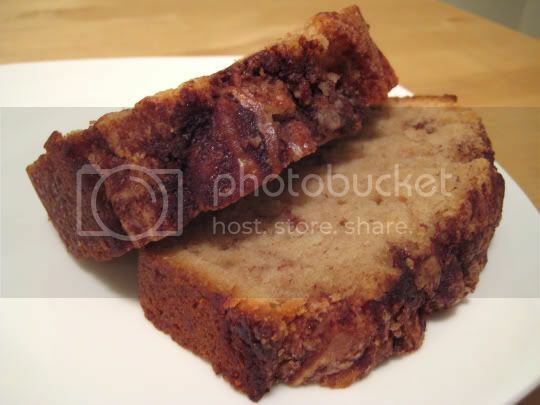 A cinnamon-laced batter is swirled with a sugar-cinnamon-butter mixture, almost like marble cake. The smell as this cake baked was delightful...but be careful of the baking time: the recipe suggests 55-60 minutes, but the traditional test of sticking a knife or toothpick to test the doneness will easily fool you. That middle layer of the sugar-cinnamon-butter filling remains buttery and gooey, even by the end of baking time. I baked mine probably an additional 15 minutes because I thought it wasn't done, and that led to an overbaked crust which eventually got a little hard. The inside, however, was perfect. And the top of the loaf...crunchy, sugary, buttery. The crust actually may have been the best and most flavorful part of the cake. Make again? Definitely. And it's even better the next day.